Birds Only - Taxidermy supplies, pins, hangers, display cases. BIRDS ONLY studio carries several products for the taxidermy trade, some of which are available nowhere else in North America. The latest generation of heavy-duty hangers has arrived for total security and peace of mind. You will never have to worry about anything heavy falling off the wall again (or even the ceiling) when one of these hangers is installed on your gamehead or panel. These new inter-locking nylon hangers are conservatively rated to hold 50 lbs. They are ideal for securing anything heavy to the wall also have many other household applications. >> View FLASH Demo Here. Price: USD $10.00 per set of two complete hangers. 1-888-850-8822, during normal business hours, Pacific Time. A new type of stainless steel adjusting pin from Germany. These versatile pins are high quality stainless steel and will not bend and break during use. They are one of the handiest little items for your taxidermy shop to come around in a long time. These unique pins are made with a convenient thin little handle, which makes them much easier to use. The head of the handle is flared out slightly. It is excellent for pinning cardboard strips on open wing mounts, holding closed wings in place, holding feather groups in place on body areas, and pinning eyelids on birds. Click on thumbnails below to see the pins in use. At last, the economical solution to glass case construction has arrived! 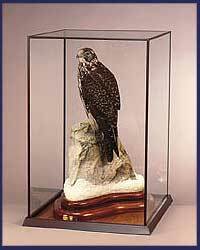 A new dynamic display case system has been designed to enhance and protect collectibles. Everything appears more elegant and distinctive when under a glass cover. Delicate artwork and organic creations such as flowers, butterflies, and mounted specimens need to be safeguarded from the environment. These beautiful do-it-yourself cases are perfect for all of these applications and more. The exclusive patented system consists of an attractive acrylic wood-grain framework designed for quick and easy assembly. You order the acrylic components, have the glass cut locally, and assemble the case yourself. Nice and simple. 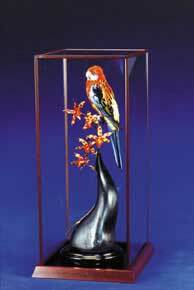 The problem of shipping heavy, breakable glass is eliminated and the cost of assembling is saved! Artists can improve their income by offering their clients a beautiful custom sized display case that can be included and shipped along with their completed work. A mirror on the backside often adds a very dramatic element to certain pieces. Keeping one on display in your showroom will encourage clients to consider having a case of their own. They will have the satisfaction of knowing their prized possession is safe and protected! Or fax your order to (604) 541-8821 during normal business hours, Pacific Time. Innovative multi-purpose nails, designed exclusively for the taxidermy industry. Toe-Nails © are an effective remedy for many difficult and sometimes neglected taxidermy problems. They are extremely sharp, strong, conical shaped, stainless steel nails to be used primarily to pin the toes of birds and animals into position. Once hammered in, their unique shape wedges the toes down tightly to the base or branch. No more loose and wobbly feet. Toe-Nails© have no heads and thus virtually disappear when driven in, making finishing work a snap. They will never rust or discolor. Excellent for competition work where every point counts. Mounts become rock solid when Toe-Nailed! Toe-Nails© are absolutely ideal for temporarily securing the skin around the bases of antlers and horns on gameheads while the cape is drying. The 45mm long nail is the optimum length and strength for this purpose. The sharp tip pierces the hide easily and penetrates into the bone with no problem. They can be used over and over again for this purpose. A thicker nail, for pheasant sized birds and many waterfowl. A longer, thinner nail excellent for toes of medium sized raptors and waterfowl and mammals such as rabbits, marten and fisher. Perhaps the most versatile nail. An intermediate sized nail for mammals such as raccoons, bobcat and fox. Also excellent for nailing the toes of larger birds such as geese, cranes, eagles and turkeys. The largest strongest nail, best for toes of large mammals such as bear, and cougar. Also excellent for securing the skin around the bases of horns and antlers on gameheads.